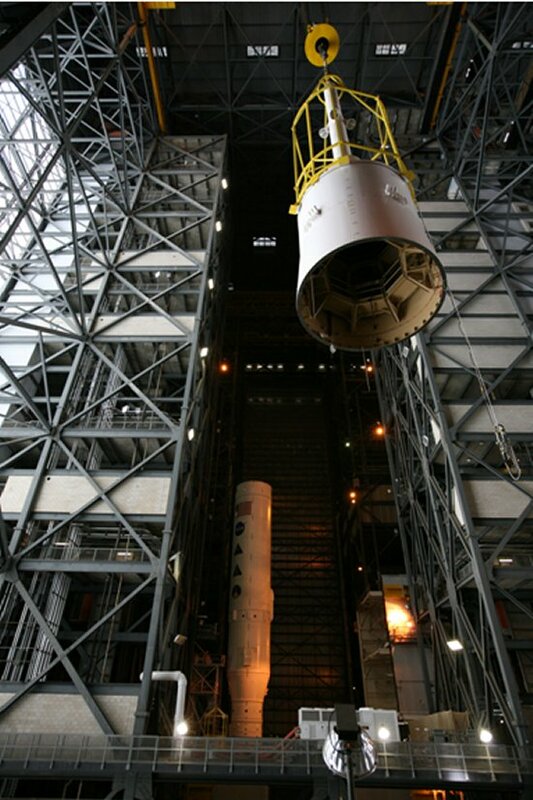 During the months of the assembly operations, the Ares I-X team stuck a camera in the Vehicle Assembly Building to record everything. 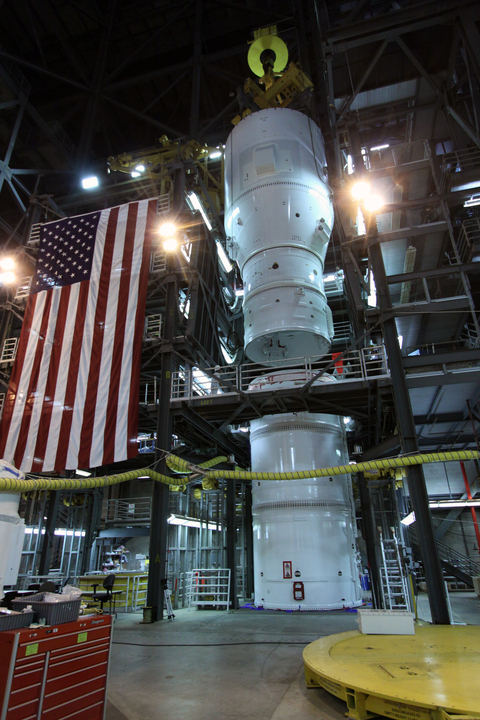 Labor Day is behind us and the I-X team is now in the “home stretch” for launch. We are on track for October 31st, which is only 51 days from now. Over the last few weeks a substantial amount of work has been completed on I-X. On August 13th, we completed stacking and final mechanical assembly of the 327-foot rocket, making it the tallest rocket in the world! 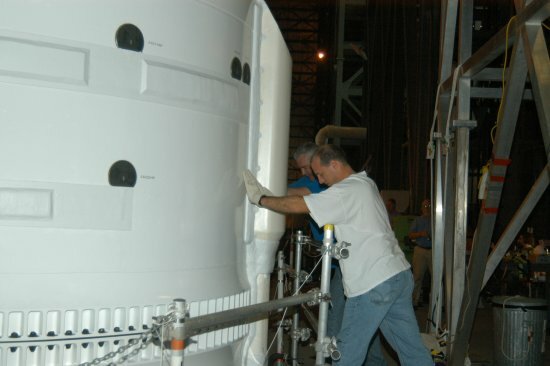 Since that time, the team has been routing electrical cables throughout the interior of the Upper Stage Simulator as well as on the outside of the solid rocket motor. In addition, final electronic components have been installed including rate gyros and a test version of the flight computer. 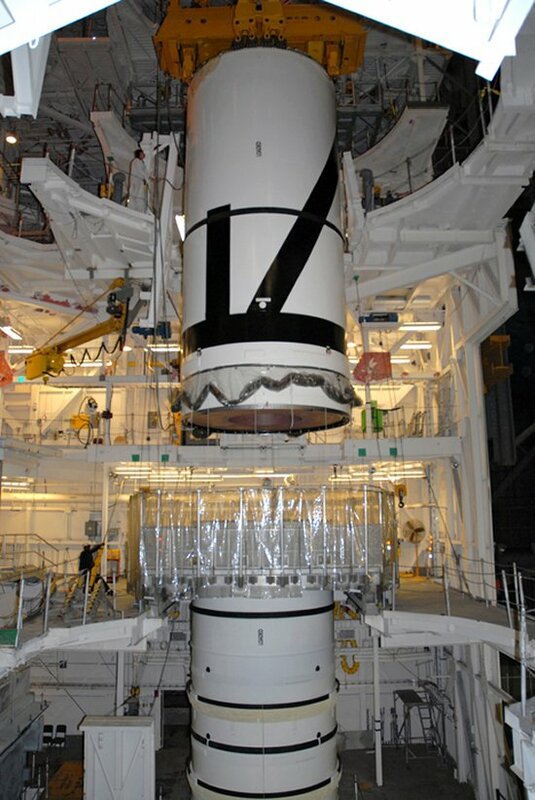 The vehicle is covered in over 700 special sensors (Development Flight Instrumentation or DFI) which have been painstakingly tested, one by one to assure their function during the launch. The next major milestone is the Vehicle Power Up, which began on September 11 and will continue through the 15th. This is the first time that either ground power or on-board battery power is applied to the electronics as a system installed into the vehicle. This is a significant step forward toward launch. After a successful power up, the team has several weeks of integrated avionics testing where each system and component will be tested and the vehicle will be run through many simulated mission profiles to ensure everything is go for flight. In parallel with all these activities on the vehicle, a lot of work is occurring at launch pad 39-B. The vehicle stabilization system is being installed to the Fixed Service Structure (FSS). This will hold the vehicle in place during the launch preparation at the pad and will be removed approximately 1-2 hours prior to liftoff. Other modifications to the pad, like new cooling capability for the avionics during ground test, are complete and awaiting the arrival of the rocket. The launch team has already been training for the launch process. 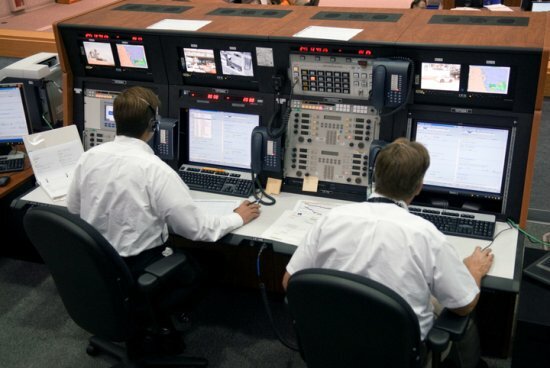 Several simulations have occurred to give the launch team experience on how to handle any problems during the countdown with this unique vehicle. Simulations will continue into October with each simulation increasing in fidelity and details of launch process and possible anomalies. 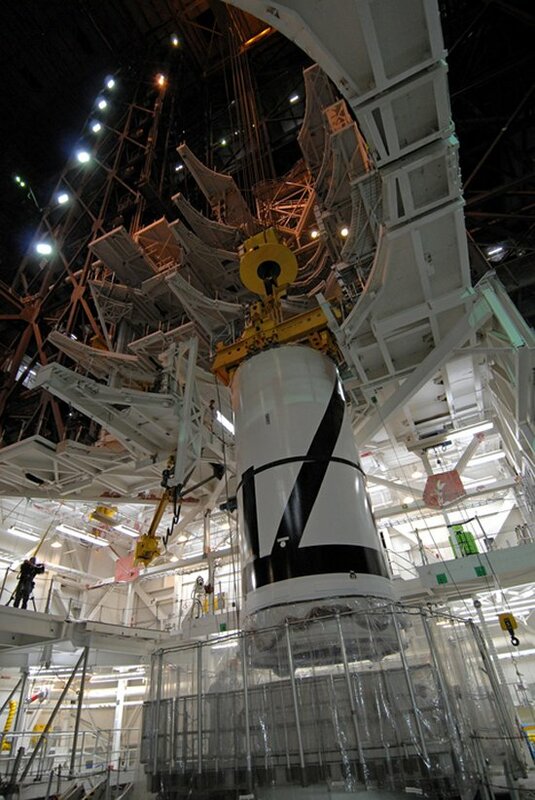 The Ares I-X team is getting really close to completing this historic launch. A huge amount of knowledge and data will be gained from this flight that will help NASA develop and refine future launch vehicles. This data applies to all future launch vehicles especially those that are an evolution of current launch vehicle technology and capability. Since the inception of this project in 2006, the NASA team along with its contractors have attempted and succeeded to do something unprecedented. This flight is truly historic not just in the amount of data that will be received but in the benefits already realized. Five different NASA centers are working hand in hand to create this new system. We have made changes in how we use computer models for key aspects of such a launch vehicle and NASA, as a whole, has become more tightly integrated into one productive group that has shown it can address and solve any technical problem that comes our way. Keep a look out for more information on I-X: The First Flight of a New Era. 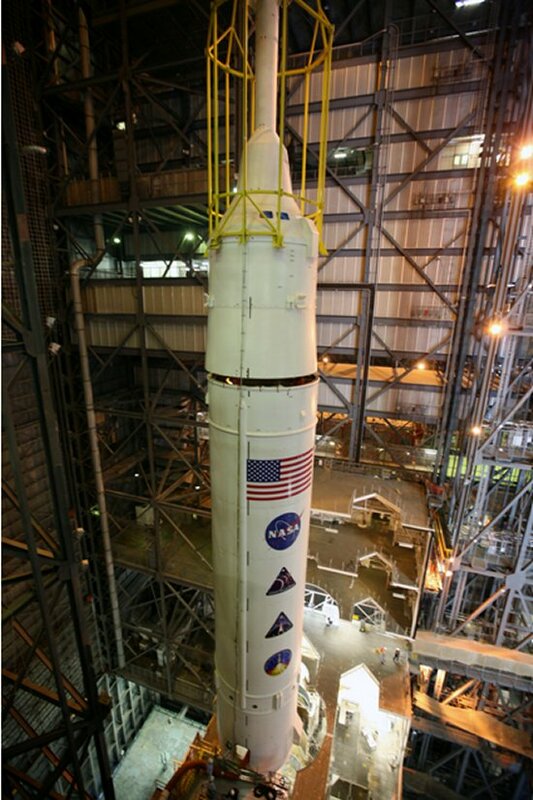 The Ares I-X Launch Team spent the day in the firing room preparing for the upcoming launch. The team conducted a simulation of the last 50 minutes in the launch countdown. Now this is no walk in the park simulation. The team was thrown different scenarios and issues that could come up during the actual launch countdown, including issues that could ultimately cause a launch delay. 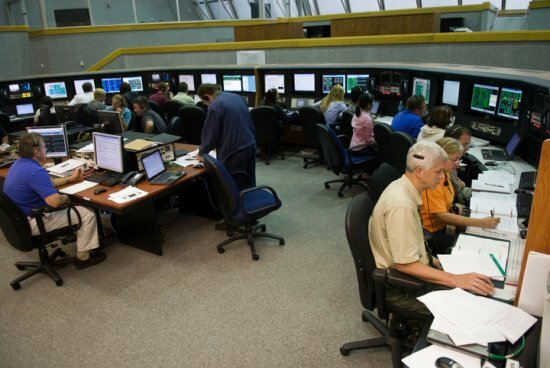 In fact, this specific set of simulations was focused on problems that the sim (simulation) team knew would prevent a launch in order to give the I-X launch team practice on handling emergency and stressful situations. All of this is designed to identify any problems in the countdown planning process and any vague areas in the launch commit criteria while stressing the team beyond what we ever expect to see on a real launch day. Sounds like fun, huh? 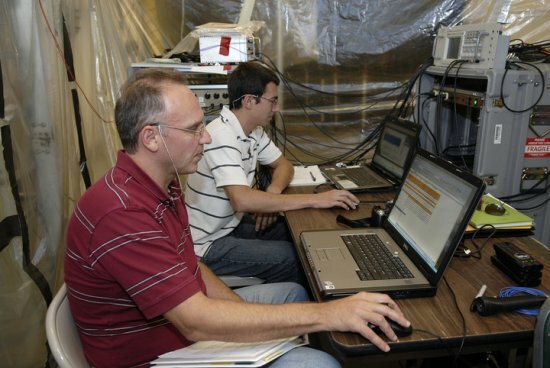 The simulation required support from Kennedy’s Firing Room 1, Cape Canaveral Air Force Station’s Hangar AE, the Software Integration Lab, or SIL, and team members from multiple NASA Centers. This was the first simulation with the entire team. 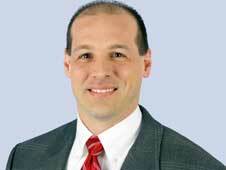 The next simulation is planned for the end of September and will include the Launch Advisory Management Team. 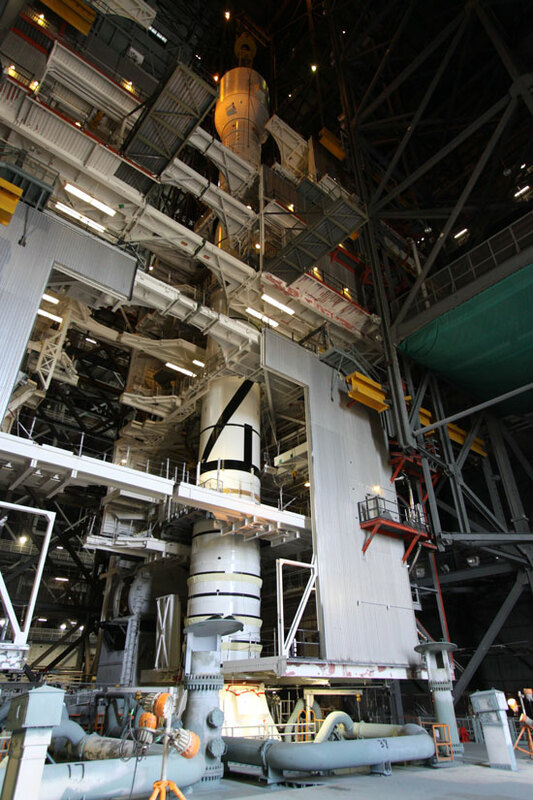 Even though the rocket is now stacked and sitting on the mobile launch platform in Kennedy Space Center’s VAB, there is still a lot of testing and prep work to be done before it’s ready to roll out to the pad. Over the weekend (Aug. 29-30) the rocket underwent two days of modal testing to make sure it’s ready to stand up to the environments it’s about to find itself in. 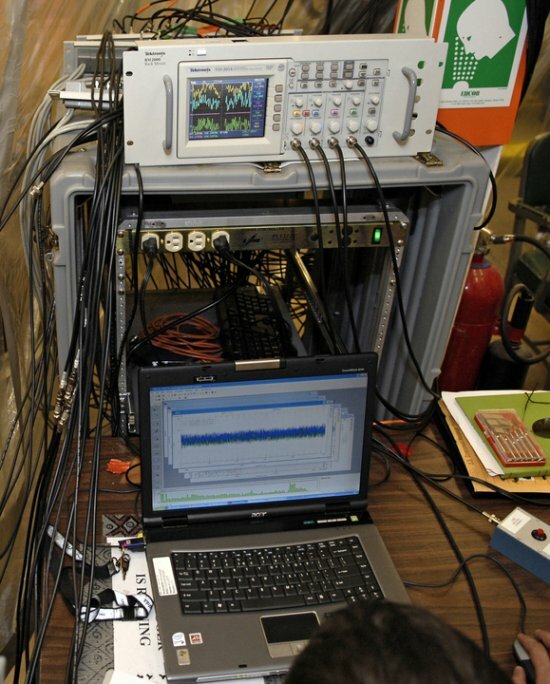 The testing required a total of 44 accelerometers — a device that measures movement — to be installed on the flight test vehicle. And to put those on the vehicle it took more than 27,000 feet of cable. That’s more than 5 miles! During the testing, vibrations were mechanically introduced into the rocket by four hydraulic shakers simulating the same kind of vibrations expected during flight so the effects could be monitored. A sway of the vehicle was then manually introduced (with a little help from Mission Manager, Bob Ess and Deputy Mission Manager Steve Davis) to create a lateral, back and forth motion so the team could measure how the rocket reacts. Here’s a little fast-motion clip of Steve and Bob rocking the rocket (Flickr). This part of the testing was important because it simulated the conditions the rocket could experience as it rolls out to Kennedy’s Launch Pad 39B, the wind conditions at the launch pad before it launches, and what it would experience during flight at first stage ignition. The completion of the Ares I-X modal testing is an important step for the mission because it clears the way for next week’s Integrated Vehicle Power Application or systems power up test, which will be the first time that all of the electrical systems, control boxes and sensors will be turned on together and powered up. Introducing 327 Feet of Ares I-X Rocket! Now this is something you’ve really got to see! For the first time in more than 25 years, a new space vehicle is assembled and rarin’ to go in KSC’s Vehicle Assembly Building. 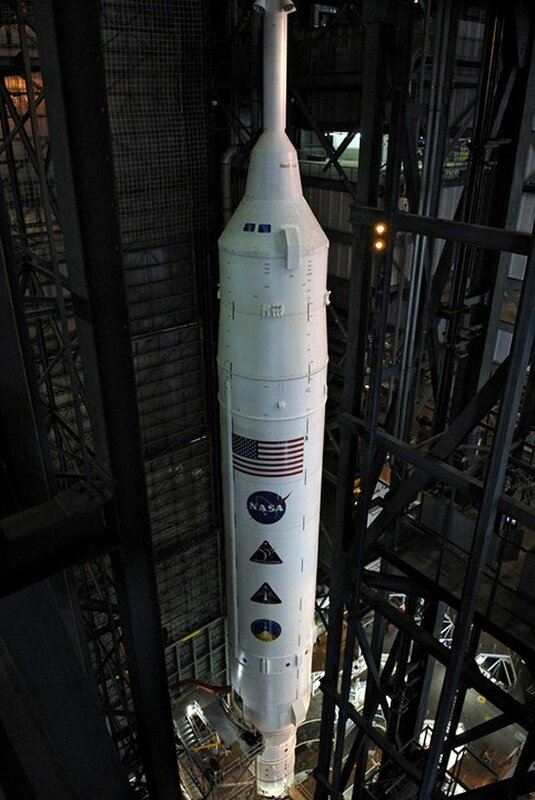 Standing more than 320 feet tall, the rocket is almost twice as tall as a shuttle stack. 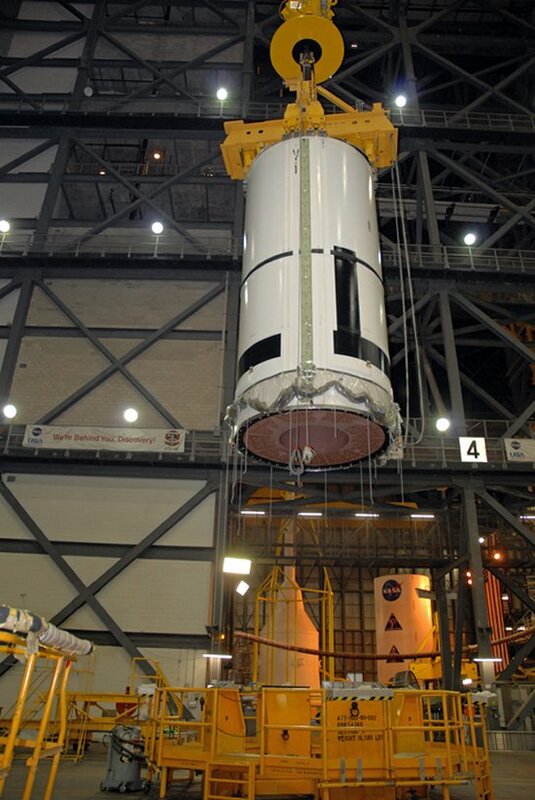 A crane hoisted the simulator launch abort system tower off the floor and placed it on top of the Ares I-X to complete he rocket stack. It’s obviously a huge milestone! Now you can really get a feel for the scope of the vehicle. 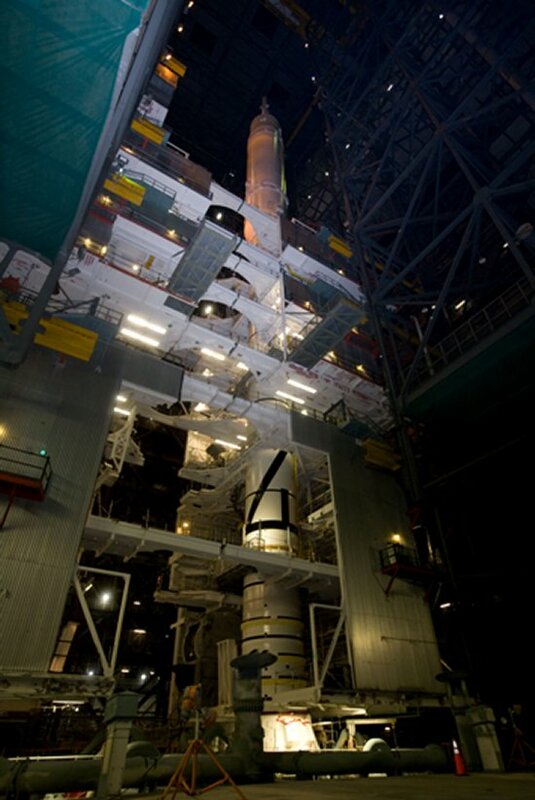 The test rocket has been assembled on the top of a modified mobile launcher that used to be used by the shuttle. 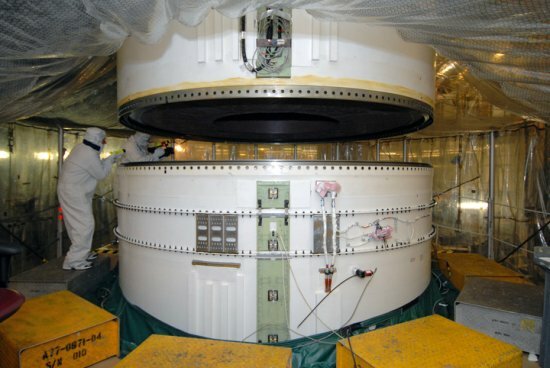 Now that it is assembled, there will be extensive tests run on all the systems, including the set of complex instruments that will measure the rocket’s movements as it launches and the first stage separates. These tests will include a process called “modal testing,” which will shake the stack slightly to test stiffness of the rocket including the pinned and bolted joints and make sure the rocket can handle the strain of launch and ascent. 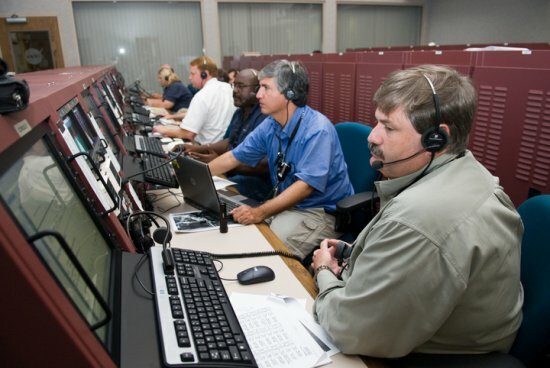 While those tests are conducted, a team of about 30 launch controllers also will practice their roles in the firing room preparing for its targeted launch in late October. 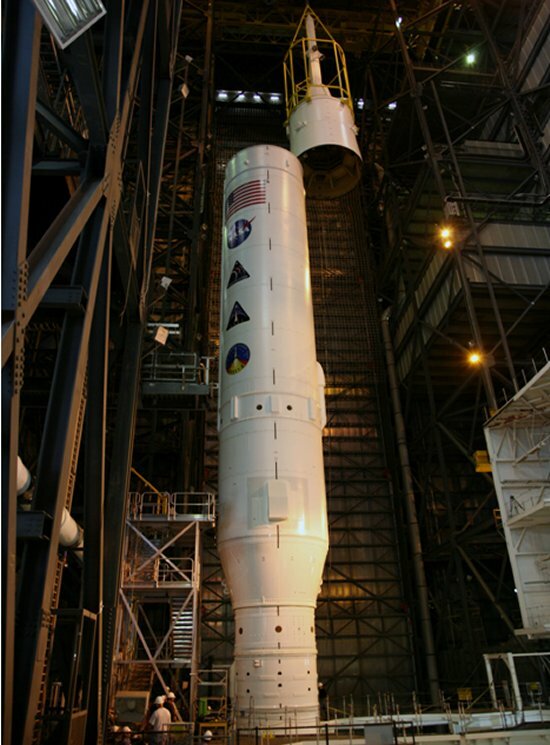 Author dnkaniganPosted on August 14, 2009 March 19, 2013 Tags ares I-X, ares rocket, first stage, kennedy space center, modal testing, Super Stack 1, Vehicle Assembly Building26 Comments on Introducing 327 Feet of Ares I-X Rocket! 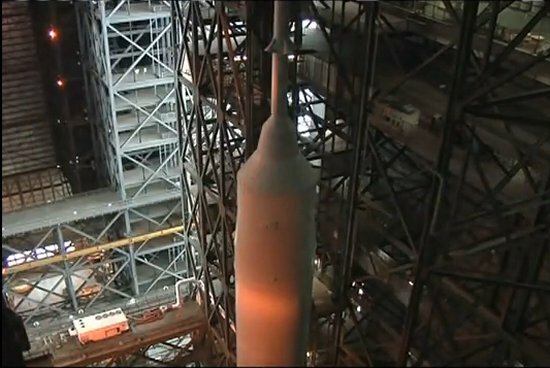 Yesterday, yet another portion of the Ares I-X rocket was stacked on the Mobile Launch Platform in Kennedy’s Vehicle Assembly Building. 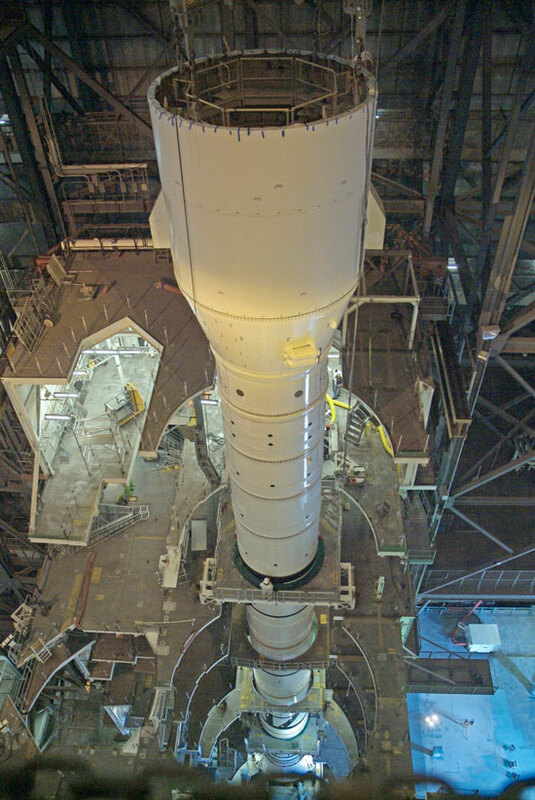 Now that super stack 1 is up and on, the 327-foot rocket is more than half way assembled and the team is getting excited as they watch it take shape in High Bay 3. Super stack 1 is composed of the fifth segment simulator, forward skirt, forward skirt extension, frustum and interstages 1 and 2. It also includes two internal elements – the roll control system and the first stage avionics module – as well as the parachute system housed in the forward skirt extension. The team used a massive overhead crane, specially adapted for I-X use, to place it on top of the forward motor segment. 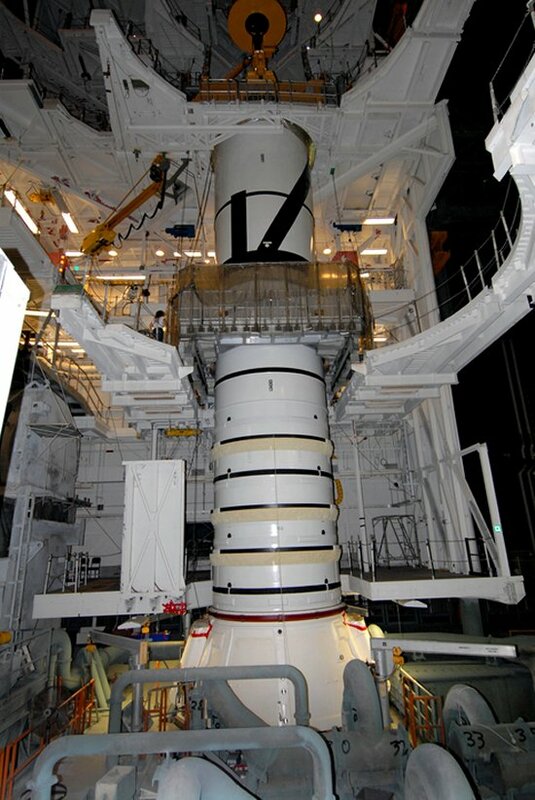 Over the next month, four more super stacks with the final pieces of hardware (including the simulated crew module and launch abort system) will be mated, finishing off the stacking operations for the rocket. 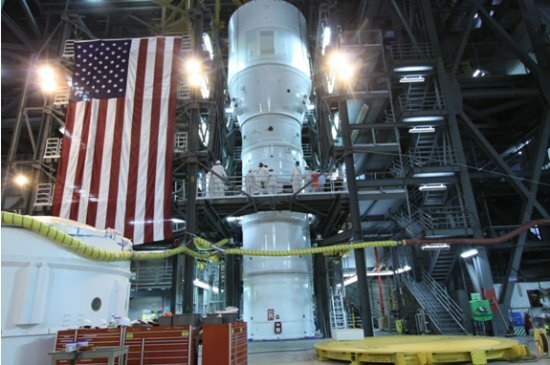 So, in about a month, NASA is going to be able to show off one of the biggest rockets the world has ever seen! 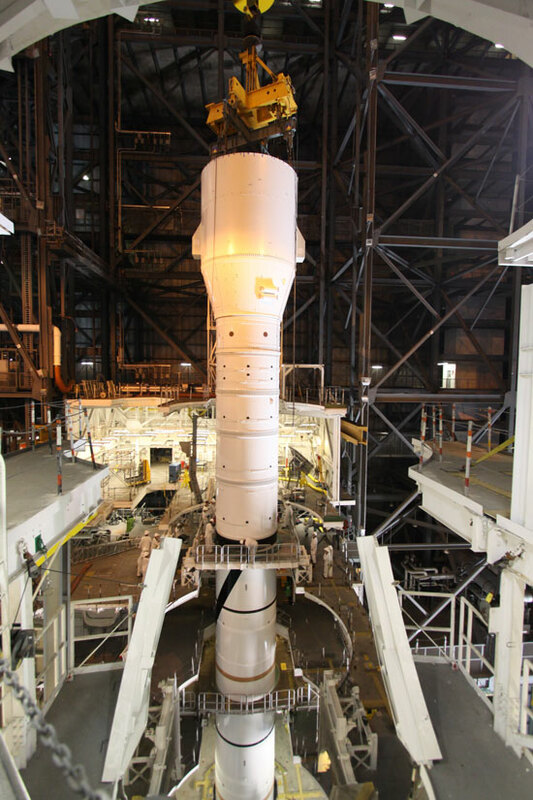 Ares I-X is scheduled to roll out to launch complex 39B just four days prior to its targeted liftoff of October 31. 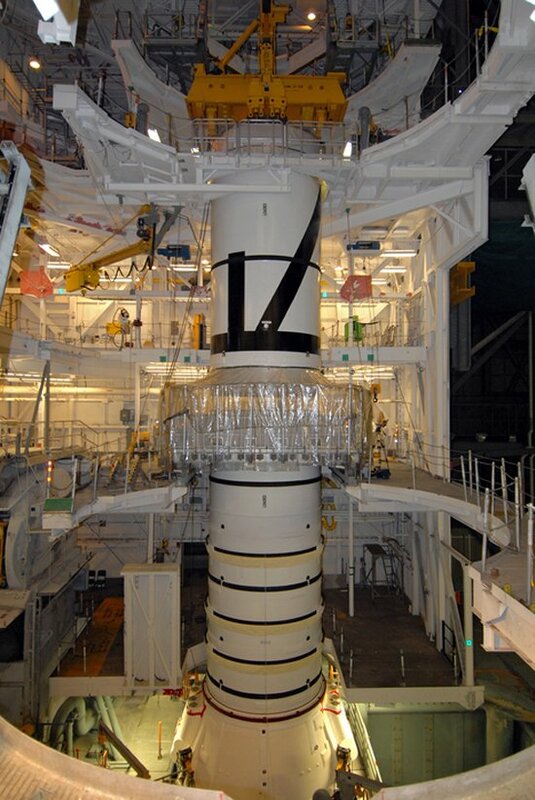 With its telltale “Z” stripe showing, the aft center section of the Ares I-X first stage booster is hoisted into place. Using a 325-ton capacity crane, the aft center is being lifted so it can be joined to the aft section already in place on mobile launch platform 1. Last week the aft section was placed on MLP 1 and locked down by four huge bolts — each of which has 750,000 pounds of tension in them when torqued down. 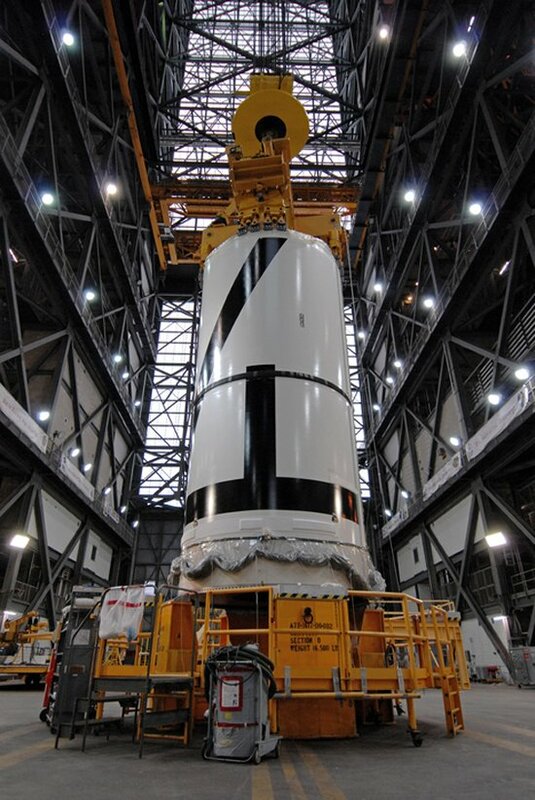 The 100 foot horizontal and 90 foot vertical journey from the center transfer aisle of the VAB into VAB high bay 3 takes many hours due to the methodical nature of handling and moving solid rocket motor segments loaded with hundreds of tons of explosive propellant. Once the aft center section is in place, the forward center section will soon be brought over and finally the forward section will be joined to the other three. 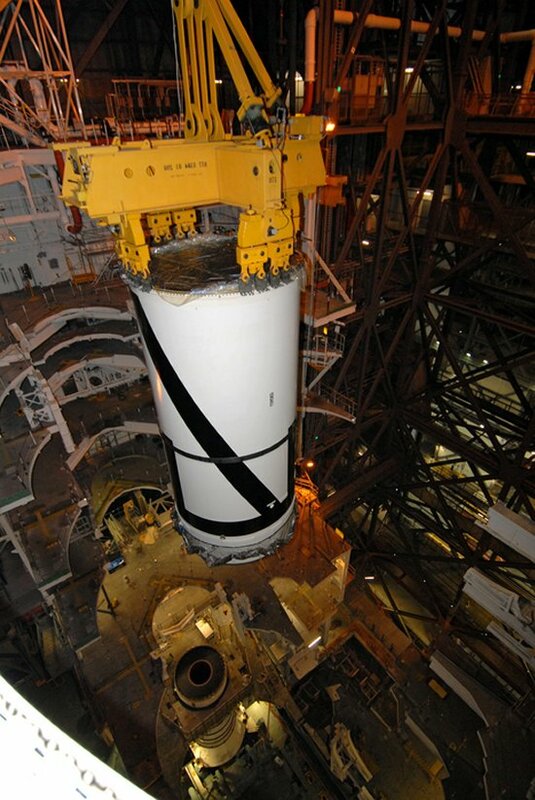 Once we have all 4 sections stacked, we will be ready for the first non-rocket motor section called Super Stack 1. 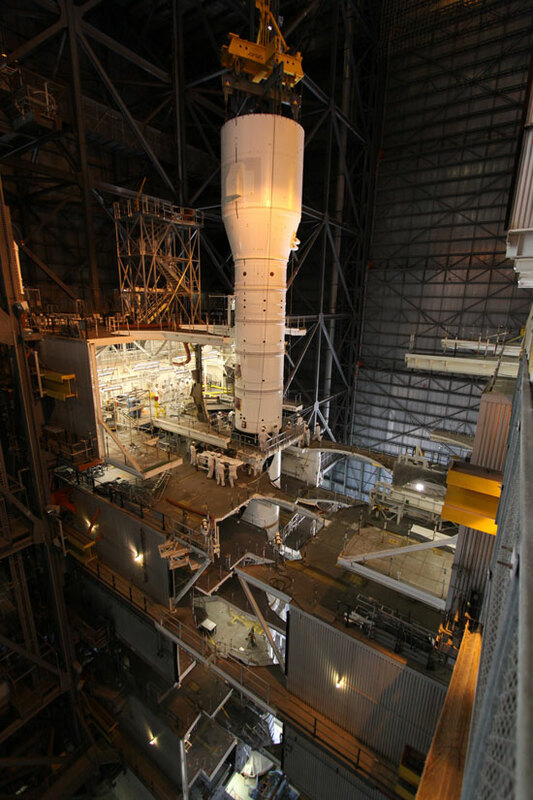 Stacking is set to begin for the Ares I-X vehicle on Wednesday, July 8 in the Vehicle Assembly Building at Kennedy Space Center. 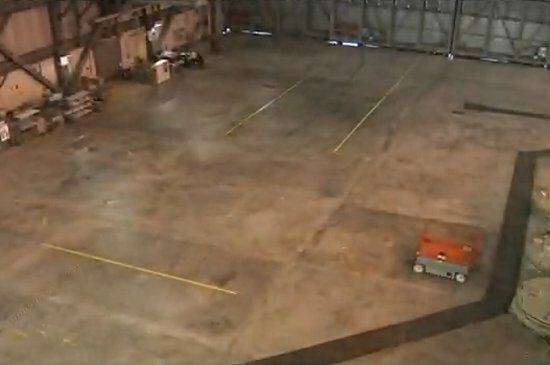 It’s been a long time since the workers in the VAB have seen a new vehicle. In fact, it’s been 25 years since a new vehicle was stacked. 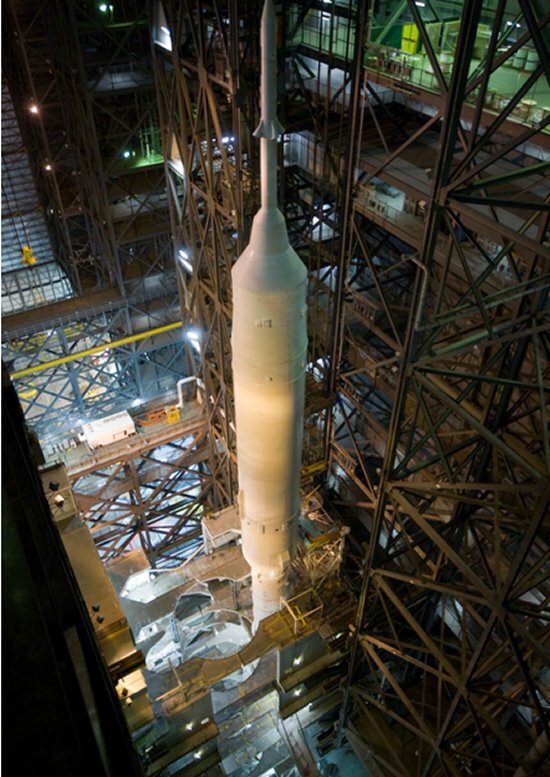 Following nearly three years of work by thousands of dedicated team members, the Ares I-X vehicle is ready for stacking on the Mobile Launch Platform, or MLP, in the Vehicle Assembly Building at Kennedy Space Center. Over the last week, the management team has met for reviews. Today, a “go” was given for the stacking operations. 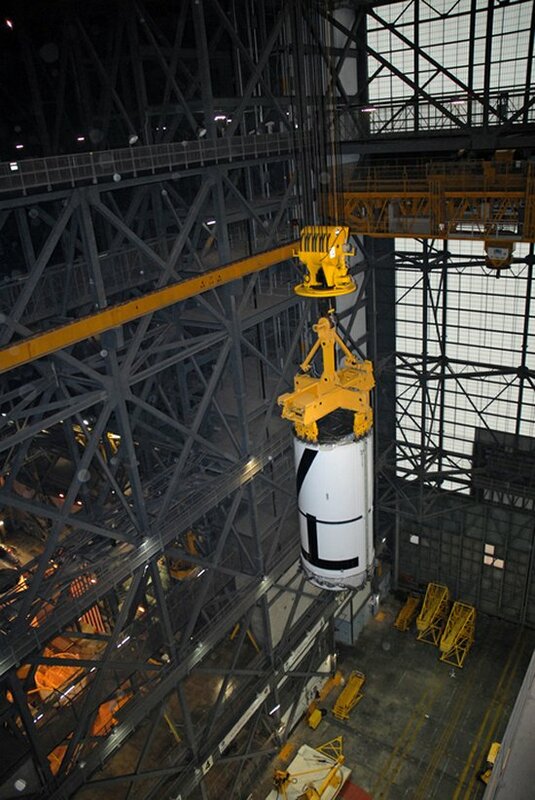 All of the modification work has been completed in VAB High Bay 3, as well as the Mobile Launch Platform, in preparation for the new Ares I-X vehicle. We will keep you posted on this blog, on our Facebook page and Twitter.